Yesterday was the beginning of my third week of training. I’ve been very excited since I started the 16-week training schedule and proud to be done with two weeks. Yesterday was supposed to be an easy three mile run. I came home late from work yesterday and was not real motivated to run but knew I had to get it out of the way before it became any later. William decided to run with me and also carry 5 lb weights with him. The great thing about this point in my training is that my runs are getting easier. It used to be difficult for me to start a run. My legs would feel heavy and it would take me about ten minutes to adjust. Now when I start a run, I feel great and can easily finish the first hill of my run without any problems. So the first five minutes of my run yesterday, I was feeling great and pumped up. My pace was nice and steady. William realized that it was more difficult than he thought to carry weights with him but managed. I started to throw punches in the air like Rocky style to motivate him with his weights and to do something different in my run. I figured why not? My cardio was steady and I was having fun with it. 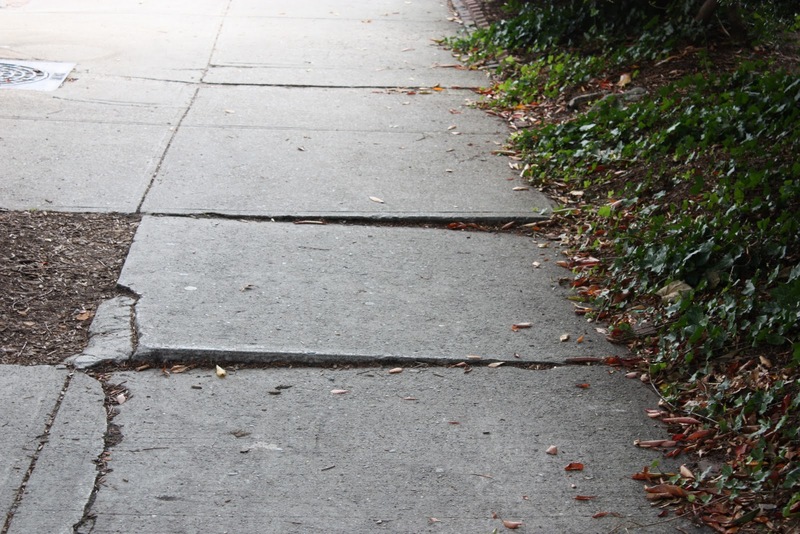 I think I have mentioned how uneven the sidewalks are around my neighborhood. 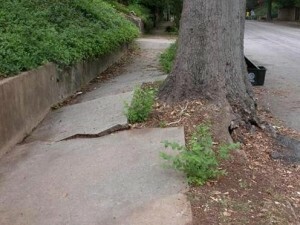 There are a lot of trees on the sidewalks causing them to create little stacks of concrete throughout the area or hills. So far I’ve been careful not to trip over any but yesterday was different. As I was throwing punches in the air, William was running right behind me. Then it happened. My foot got locked in one of those cracks and I flew forward. Everything after that happened so quickly. I flew forward in full force and started to land. My knees hit the concrete first, then my hands landed on the ground. I didn’t stop there, my body still was going forward so then my left shoulder hit the wall that happened to be there for the house in front of us. And then my left side of my head hit the wall. I felt like a church bell where all of of sudden I had been banged up for the seven o’clock hour. I laid there shocked and saw William coming towards me with his weights. Everything hurt and was I was shaking. Or maybe my head was still vibrating from the crash to the wall. I kind of wanted to cry but I did not want to. I did not want to be a baby about it but at that moment I did not know how to feel. My knees were pretty banged up and I didn’t want to get up right away. Immediately William wanted me to go back home to ice my knees. I became angry at the streets! Stupid streets! Why were they so uneven! I was already almost up to a mile into the run and then this happened. So we started to walk back towards the house. A few minutes into my walk everything started to hurt. William felt really bad for me because he saw everything happened. He described it as being slow motion and saw the order of each body part hitting something and had no time to help me. Not only that but I was loud! My bones are loud! We remember hearing each body part hitting something. It was like if somebody had dropped a trash bag full of bones out in the sidewalk. That was me. William was just happy that it was not worse and I did not have any fractures. It was just bruises and scratches. We finally made it back home and we iced my knees for a while. I then felt the pain come afterwards but I know it won’t be that bad. My head felt better afterwards. I was disappointed that I did not get to finish my three miles. I guess I still cannot throw air punches and run at the same time. Stupid sidewalk. I stated on my last post that I started to panic about the marathon. Just a few months away and I feel that my progress is very slow. I don’t mind the running, it’s finding the time to run that has been the biggest challenge for me. I wake up in the morning usually before the alarm wakes me up at about 5:30am. I’m one of those people that wakes up when there is daylight. But just because I wake up so early does not mean I have the energy to go outside to run. I was able to do this at the beginning of the year. It’s just very difficult. I wake up, go to the bathroom and as I’m sitting there peeing, I start feeling the cold and the stiffness of my body. So I crawl back under the bed sheets and tell myself “just ten more minutes under the sheets” and then I will go run. I do that for about half an hour and before you know it, it’s time to get ready for work. I’m an early bird but not an early runner. I need to warm up for about an hour before I decide to go run in the morning. I know I will need to change that because I know I do not always have time after work to run. I think this has been part of the reason why my progress has been slow, because I count on the evenings for my training. So as my worries began about my training, Coach William came to me with a solution to all of this. He gave me a sheet that he researched online that is a 16-week marathon training schedule. It was the perfect timing for this. If I get on this schedule now, I would be on my 2nd week of training which is not bad because I basically did week one with the miles being a little different. I started week two on June 5th. If you read the chart above, the week starts on a Monday but I will actually start the week on a Tuesday. This is because I would rather have my rest days on Saturdays instead of Fridays or Sundays. In my daily schedule, I usually always keep my Sundays free so this would be a good day to do my long runs instead of Saturdays where I usually work for my job. 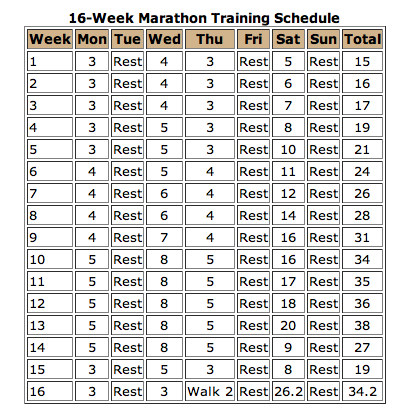 If I keep this training schedule, I should be able to finish exactly on the day of my marathon. Week 16 will be Hawaii week! When William showed me this, I became very excited. I think each brain is different and I do better with visuals and calendars. I guess what was missing was some set direction. Before this, I knew I had to run shorter runs during the week and longer runs during the weekend, and be able to increase it every week. Now that I have a chart, I know exactly what I need to do and when to do it. Also, it came at the perfect time. If I don’t follow this schedule, I won’t be able to run the marathon. This chart makes sense to me and so far I’ve been able to follow it. So far I finished week two without any problems. Week three starts today! When I cook, I think it’s pretty healthy. I always buy organic meat, buy the gluten-free pasta, lots of green vegetables, and I also use a lot of spices to flavor the meals. I just have to make sure I don’t stuff myself and stop when before I get too full. Going back to my runs for May, I ran about a total of 60 miles. My longest run was a 6.5 run and my longest hike was about 10 miles when I hiked Mt. Baldy. My average run was about five miles. I wanted to make my minimum run six miles but there were days where I wanted to get home and do other things and did not have the time to make my run longer. 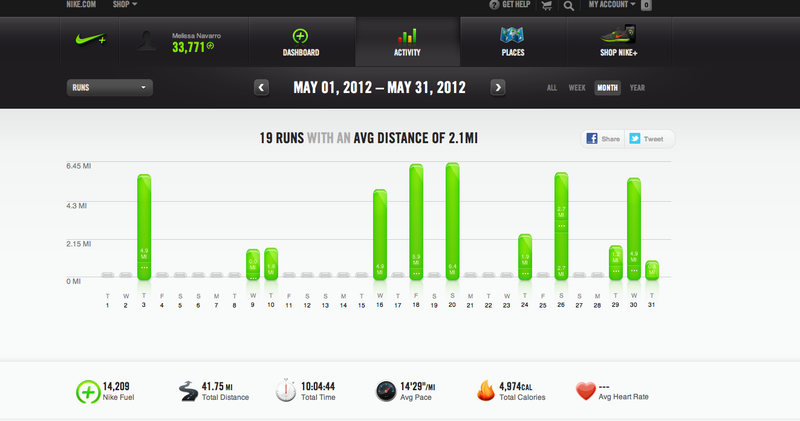 The above chart is a snapshot of my runs for May through Nike Fitness. There are some runs that are not recorded because I forgot to take my iNano with me when I ran, but I do remember which runs they were. 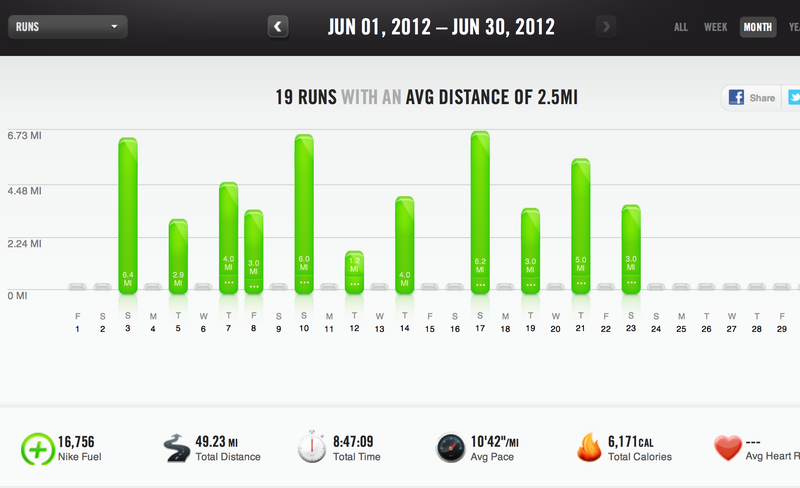 Overall I’m pretty happy that I was able to get my runs in May. At the end of the month, I still got worried because I realized how close September is and I’m still only at about 6 miles. I started to panic because it seems that I will not get to my goal of 13 miles in July! Gotta keep trying!! !